Chandra is a committed sales associate with commercial experience and a strong concentration in residential resales. 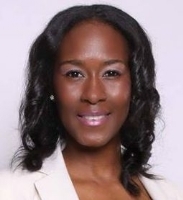 She is a HUD Homes and Short Sale Specialist and is dedicated to serving her clients with a work ethic and business practice that is personalized, well-organized with an unmatched level of professionalism. Her negotiating skills and knowledge of the ever-changing real estate market makes for an effortless process for our buyers and sellers. Chandra is a graduate of Winston-Salem State University and is licensed in Georgia and North Carolina and looks forward to becoming "Partners in Success."